"I'm loving my pixie." I never thought those words would come from me. While sipping a latte at a coffee shop last month, I noticed a young woman breeze through the door with a boundless, carefree spirit. She had it -- that magical quality some women possess that I wish was contagious. Peeling my eyes away, I looked around the room to find I wasn't the only one entranced. I motioned to my husband whose eyes fell upon her. He paused then remembered to breathe. There was something about this young woman, a certain quality she possessed that made others stop, stare and take notice. What was it? I can only describe it as a certain something some possess, a uniqueness that defies definition and sets them apart. We've all seen it. From my little corner, I tried to decipher her it factor and watched as she engaged in conversation with everyone around her, as if inviting them into her enchanted world. She was stunning. She had a pixie cut. A pixie says everything without saying anything at all. It says a woman is independent of her hair, that comfortable blanket so many cling to (especially me.) I felt a pang of yearning. Could it be? Did I really want a pixie cut? Panic. What in the hell was I thinking? "You should do it," my husband prodded, as if reading my mind. "Cut your hair like hers." "I can't pull that off. No way." My stomach in knots, I introduced myself to pixie girl and gushed over her hair. She worked at the fancy salon next door. Of course, she did. Hairstylists notoriously took crazy risks with hair. Not me. I'm a 43-year-old mom who works in an office. I wouldn't shave my head if my life depended on it. 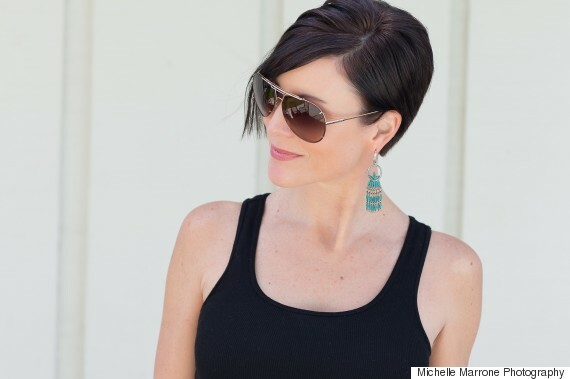 "I'd never do anything as drastic as a pixie," I whispered to my husband. I was tired of my stringy hair, tired of living in the homogenized world I'd created for myself, tired of looking like "everybody else." Pixie girl didn't need a curtain of hair to hide flaws or boost femininity. And I loved that. Now, this isn't an ode against long hair. Long hair made me feel beautiful which was precisely what caused my hesitation. Would a pixie make me feel unattractive? I clung to pixie girls' parting words: "It's just hair. It grows." A frantic internet search for pixies illuminated I wasn't the only woman straddling the #pixienation fence. Many women worry boyfriends/husbands won't find them attractive. So, I watched and read everything I could about pixies, from YouTube videos on pros/cons to articles illustrating everything I "needed to know." Apparently, cutting off one's hair was serious business. Then came the warnings: No more ponytails. Bedhead issues. Men thought pixies were ugly. Some perceived pixies as an affront to femininity. Women would hit on me because I'd look like a lesbian (I laughed and asked lesbian friends about this. They laughed.) I was advised to make a "Why I Cut My Hair" list for the inevitable moment I found myself in a puddle of regret. Then there were the pros: I'd actually have a hair style. Hair would no longer get stuck in lip gloss or whip my face when I drove our convertible. I wouldn't find tumbleweeds of hair in the corners of my house. I'd save time on my morning routine. I'd feel liberated. Hair. It's a polarizing issue and I admit my identity was wrapped up in it. However, it's not world peace, global warming or nuclear armament. So, I nervously made an appointment and lost three pounds the week of my cut (I now refer to this as the pixie-cut-diet.) I couldn't eat, my palms were sweaty and my heart raced the day of my appointment. Referring to "inspiration" photos, I prayed the stylist (whom I'd never even met) would understand what I wanted, even though I didn't. Not exactly. 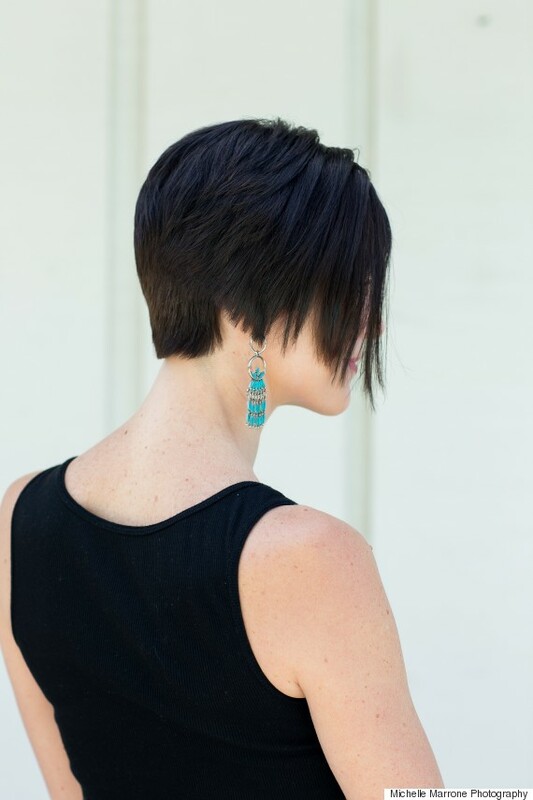 When I looked for inspiration, I liked the bangs of one cut, the back of another and the sides of yet another. I was uncertain up to the very last second. Before I could protest, she grabbed scissors and cut a huge swath of hair on the back of my head, unceremoniously throwing it to the ground. It landed with a thud. She proceeded to cut, chop and lop off hair as my heart raced with every clip. Three hours later, I didn't recognize myself. My neck was cold and I felt the draft in the room, something that still takes me by surprise. I paid her, hugged her, and the rest is a post-pixie blur. The "morning after" I had a mild freak-out. I just didn't know how to style my hair. The first week found me using products I'd never used while wondering how my clothing/accessories style might change. It was not love at first site. It's taken a full week to appreciate this awesome, short cut and to feel as if it belongs to me. Yet, with each passing day, I feel sexier and more sophisticated. I have style. I never thought those words would come from me. They've arrived slowly, by adjusting to a new normal and revisiting those cute pixie pics to remind myself why I did it. In making the cut, I realized that thing women have who pull off pixies? It's an energy one exudes -- a combination of style and confidence. Neither can be bought or borrowed but they can be unlocked. In cutting my hair, I unearthed a self-assurance I hadn't yet fully realized. I feel free, beautiful and, yes, feminine. If you're on the pixie fence, go for it! It's only hair...it grows.